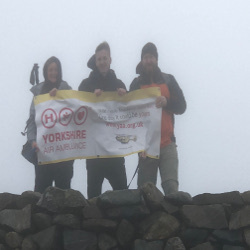 Over the last few years, the Craven Safety Services team have taken part in a charity walk in aid of the Yorkshire Air Ambulance. It costs £12,000 per day to keep both of the Yorkshire Air Ambulance helicopters maintained and in the air. This is equivalent to £4.4 million per year. As a rapid response air emergency service the Charity serves a population of approximately 5 million people across 4 million acres. The two Air Ambulances operate from The Nostell Priory Estate near Wakefield and RAF Topcliffe near Thirsk, and together both Air Ambulances cover the whole of the region. The paramedics are on secondment from the NHS, but all the rest has to be funded. We take pride in the fact we help out with a tiny fraction of that every year. This year on Monday 10th September we climbed the highest mountain in England, Scafell Pike. The plan was that the whole team was going to climb it but unfortunately Debbie and Abi couldn’t take part. Liz, Ian, Jake, Yorkshire Air Ambulance volunteer Martin and the office dogs managed it starting early on the Monday morning. We were supposed to video along the way but with the bad weather there wasn’t much to video! We have a few pictures that you can find on our social media or website.